Beaufort County Sheriff’s office recommends signing up for Nixle this service sends information from the department. 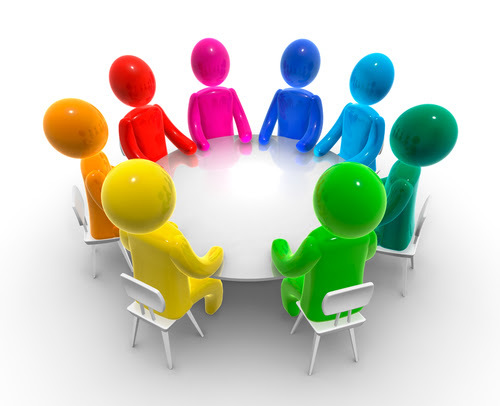 FIPOA meetings are open to the Members. 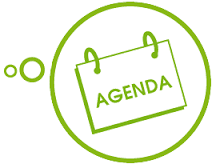 In an effort to keep the Members better informed, these bi-weekly e-blasts contain a list of upcoming FIPOA committee meetings for the next two weeks. These dates & times are tentative, so please check with the FIPOA office at (843)-838-4155 to make sure that the meeting date & time has not changed. Beach Access #15 at Rock Beauty will be closed this afternoon to all traffic. Post Irma repairs are scheduled to begin. As soon as the work is completed, we will reopen it to all traffic. In the meantime please stay clear, as there will be construction equipment. WILL BE LIFE THREATENING TO ANYONE WHO ENTERS THE SURF. * BREAKING WAVE HEIGHTS…5 TO 7 FEET. AS PIERS AND JETTIES WILL BE PARTICULARLY TREACHEROUS. At 5 AM, Hurricane Maria was 900 miles SE of Charleston tracking NNW at 7 mph. Max winds are 125 mph. Maria’s symmetry has changed markedly overnight after interacting with the Dominican Republic. Rum drinks and the hot Caribbean sun will do that, … so I was told while painting the orphanage with the Sisters on ST. Maarten, but I digress. The eyewall complex is obscured by the central dense overcast but has tightened up overnight while the hurricane gets its last shot at intensification over the warm waters east of the Turks and Caicos. The northern extent of Maria is starting to interact with shear to the west. Weakening due to shear will increase once Maria passes north of 25N tomorrow. Further weakening will occur as Maria encounters the swarthy cool wake of upwelled water left by Jose. 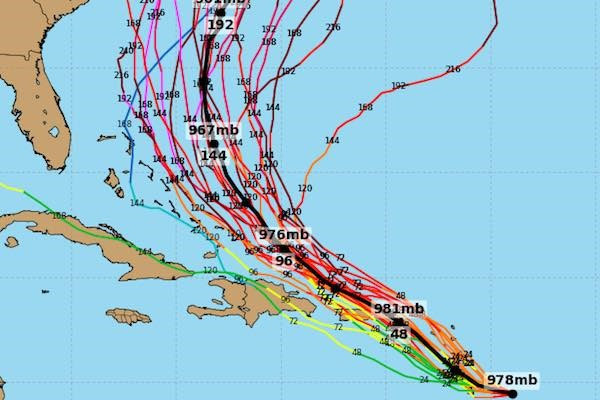 There has been little change to the forecast track except for the date. The last few forecast advisories have slowed Maria down to 6-7 mph vice yesterday’s 8-9 if only for the media drama that is in it. Maria gets slowly shoved north by the subtropical high to the east, passing the South Carolina outside 500+ miles. Maria should be passed and opening our coast by lunch Tuesday. Astute readers will notice a jog to the west in the official track caused by strengthening of the subtropical high late in the official forecast. Fret not, Jose has been a stalwart placeholder of a deep trough that keeps Maria slogging north. Do I hear La Marseillaise? FIPOA has arranged for Low Country Sanitation to pick up our flooded white goods! And we need VOLUNTEERS!!! We will need strong folks with trucks, trailers, dollies and hand trucks. The good news is this year our volunteers WILL NOT have to remove DOORS!! We just need folks to move the items to the loading site. If you don’t need it picked up, the drop-off site will be announced closer to date and it will be open beginning Sunday, October 1st at 1:00PM through Monday, October 2. All items will need to be delivered to the site during these two days. Please ensure that your freezers and refrigerators have been cleaned out. No items containing food will be accepted or picked up by volunteers. This is for white goods only. No Construction debris! For white good pickup please send an email to Tina Turner at turner.fripp@comcast.net with address and items to be picked up. Roadside pickup will NOT be for construction debris! !FIPOA will ONLY pick up vegetative debris and random trash that washed into your yard. This is not the time to clean out your garage at the expense of your POA! Lowcountry Sanitation is in place with dumpsters behind at the Springtide Parking area next to the Community Centre. They will only accept refrigerator/freezer waste. If you have rental guests, they are now welcome to come to the island. Careful out there folks. Just as Hurricane Irma disrupted your life, our alligators were also impacted. Some were displaced by flood waters and storm winds; others had their homes impacted and are on the move looking for new places to rest, hide and hunt. Still, others may have come onto Fripp from neighboring islands. 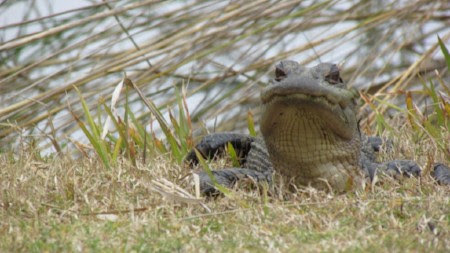 We have alligators in our dune lagoons, they may be under houses and in murky waters on lots…..or in your garage! There is no telling where they will turn up! Call Security at 843-838-2334 if you see a gator where you don’t think he should be! Stay clear but try to watch the gator’s movements so you can provide an arriving officer with good information. Roadside pick up STARTS today and will continue for quite a while. We want to give nonresident owners a chance to get here and have their properties cleaned of debris. The crews will start with the main arteries and work through to the smaller neighborhoods and they will make more than one pass. This clean up will NOT be for construction debris!! FIPOA will ONLY pick up vegetative debris and random trash that washed into your yard. This is not the time to clean out your garage at the expense of your POA! Please separate the vegetative debris from the non-vegetative. If you don’t need it picked up, the drop-off site will be announced closer to date and it will be open beginning Sunday, October 1st at 1:00PM through Monday, October 2. All items will be need to delivered to the site during these two days. Please insure that your freezers and refrigerators have been cleaned out. No items containing food will be accepted or picked up by volunteers. This is for white goods only. No Construction debris! For white good pickup please send an email to Tina Turner atturner.fripp@comcast.net with address and items to be picked up. If you are having connectivity issues with your Comcast cable, send an email to Holly Beverly please include your Fripp address. If you have rental guests, they are welcome to come to the island. Careful out there folks. Just as Hurricane Irma disrupted your life, our alligators were also impacted. Some were displaced by flood waters and storm winds; others had their homes impacted and are on the move looking for new places to rest, hide and hunt. Still others may have come onto Fripp from neighboring islands. Speaking of refrigerators, Tina Turner is coordinating the effort to pick up any ruined refrigerators & freezers. They MUST be emptied and washed out first! Please email her if you are willing to volunteer your brute strength, or truck or trailer. Also, email her if you have a ruined refrigerator & freezer. As soon as we have a firm pick-up date, we will post it. Remember, if you are replacing your drowned items, companies like Lowe’s will haul off the old ones. The Vacuum sewer is working island wide! If you have rental guests, they are now welcome to come to the island. Dr.Robert Young performed a coastal flyover of the S.C. coast and has confirmed that Fripp has suffered significant beachfront changes. The current priority of the Shoreline Committee is to restore vehicular access to Rock Beauty, which had significant subsurface erosion from surge overwash. The geoweb stabilizing fabric will be destroyed if subjected to the weight of vehicles. Once restored the contractor performing marine debris removal will be able to proceed. Aerial imagery shows the continued destruction of Hunting Island’s coastline as well as further loss of trees and vegetation. The surge which hit the Fripp coast near access 2, slammed the access with over 20 palms and other heavy marine debris. While the damage is disappointing it will be addressed. There was significant dune loss as well the loss of newly installed dune fencing. As hurricane season concludes new fencing will be installed to encourage new dune growth. The Fripp beach has become saturated with water. The Shoreline Committee will work with the authorities to attempt to address the standing water and areas of shoreline with significant erosion via emergency measures. Access construction will continue as conditions permit. We are grateful for a dedicated team of consultants, contractors, and volunteers who will enable a complete Fripp beach recovery. Many thanks to all who owners who are offering to assist in the recovery efforts. At the present, it is critical that contractors perform the potentially hazardous and arduous tasks ahead. Thank you for your support and encouragement. So far it looks like Maria is staying away from the southeast coast of the US. I hate to be the bearer of bad news and hopefully, this is only a “Word to the Wise”. Today the National Hurricane Center was extremely busy. 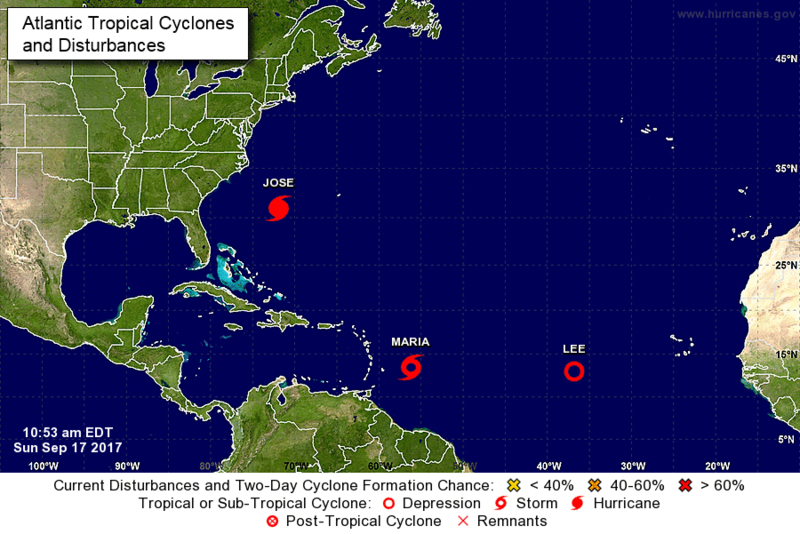 They are now tracking three named storms in the Atlantic. Tropical Storm Jose is forecast to regain hurricane strength. Other than more erosion to Hunting Island’s already devastated beaches, there should be no impact to Beaufort County. Tropical Storm Lee is in the far Eastern Atlantic and is forecast to be a fish storm. 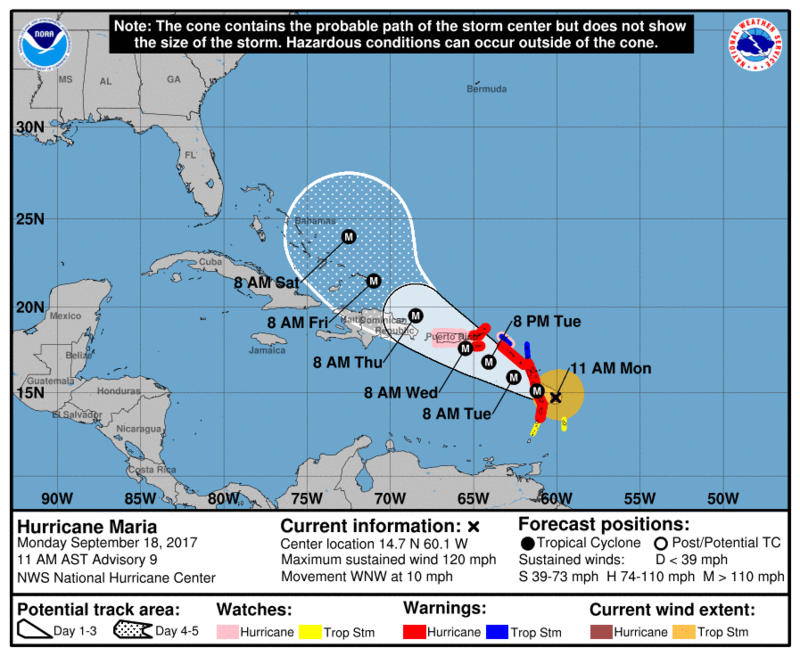 Now, Tropical Storm Maria…. Named earlier today. Below are the key forecast graphics as issued today by the NHC. As the week progresses, the Beaufort County Sheriff’s Office Emergency Management Division will be closely watching Maria. Updates will be released as appropriate. Irma’s wrath has damaged the access at #15, Rock Beauty. The access is closed to all vehicular traffic until repairs can be made. The geo-web (textile fabric) is too fragile to hold the weight of any type of vehicle. Pedestrians are welcome to walk down the access. The owners of these properties have been contacted. All other homes on Fripp Island are now cleared for normal sewer usage. If you notice water or other material coming out of your air intake pipe (candy cane) or sewer cleanout in your yard, please call our office at (843) 838-2400 immediately. This could indicate that the vacuum system that serves your property is experiencing a failure due to flooding. Thank you for your patience and for following the recommendations of the PSD throughout this process. Your assistance has been instrumental in allowing us to bring our sewer systems back online quickly and with minimal damages. We are thankful for the many property owners who have been spared major damage from Irma. There is always a sigh of relief when we find everything intact and undamaged. But many others have sustained significant water damage and one of our neighbors lost their home to fire. While we focus on the larger picture of roads, utilities and sewer systems, it is also important to realize we have an opportunity to lift up those who have been humbled by these storms. Thank you to those kind neighbors who have offered to help with power washing, clean up, rides and minor repairs. You are my heroes. But we should try to do more. If anyone has the means, the equipment and time to do so, please let us know and we will make a list of volunteers willing to help. We have also raised a small emergency fund (not POA monies) to help the volunteers cover their expenses or purchase supplies and equipment they need to help with the work. Perhaps we can coordinate with the Community Centre to organize something more formal. As a community we have the time and talent to make a difference. As of this morning, most all of the roadways are passable. The only area left in need of major pumping, as of 9:30, is Dolphin Annex. Sewer systems are partially restored to a good part of the Island and the plan is to be fully operational by tomorrow. PSD will continue to send out very specific messages for each area, please pay close attention to the directions. Sewer system needs to be fully functional before we admit rental guests to the Island. Remember – only vegetative debris at curbside in one pile. Any items that may have been washed up onto your property should be placed in a second pile. Lowcountry Sanitation is located behind Sand & Seas to accept refrigerator/freezer food trash. Earthworx is beginning to restore roadsides & common areas today. Comcast has told us they need to hear from YOU if your cable/internet isn’t working. Please call them directly 800-COMCAST. We are frequently updating the list of service providers so that owners can get contractors they need to do the work to repair their properties. If you have any questions, please call the FIPOA office – 843-838-4155. If you have questions regarding Fripp Resort and it’s re-opening, please call 843-838-1558. The FIPSD has made significant progress in bringing our sewer system back online. All other areas can now flush and shower sparingly. Please do not wash clothes, or use dishwashers until further notice! Minimal usage will assist in preventing sewer backups and damage to the sewer collection system. If you notice water or other material coming out of your air intake pipe (candy cane) or sewer cleanout in your yard, please call our office at (843) 838-2400immediately. This could indicate that the vacuum system that serves your property is experiencing a failure due to flooding. We’re sorry for the inconvenience and thank you for your continued patience as we work to bring our sewer systems back online. Phone bank: (843)-838-4155 will reach Kate and her staff, plus we have 2 extra lines that volunteers are manning (843)-271-2372 and (843)-271-0693. Disposal of trash. Large Dumpsters will be delivered TODAY and they will be placed in The Springtide Village lot behind Sand & Seas. These are to be used for refrigerator/freezer garbage only. You can bring your garbage after 3:00PM. As for picking up white goods, we will get back to you with directions soon. You should be aware that gators, snakes and other wildlife, including raccoons, may approach or enter yards, garages and beneath houses seeking cover. Over time, displaced wildlife will return to their usual habitats. Common sense precautions should be practiced. Be aware that snakes and other animals may seek shelter in debris piles and caution should be used during cleanup efforts. Do not stick your hand in areas you can’t see! Do not approach a gator in the yard. Call Security for assistance. Stay away from the gator but try to monitor any movement until Security arrives. A snake in the yard is not a cause for panic, It doesn’t want to be there and if left to its own devices, will usually leave. If you do have an encounter with a problem snake, seek help from Fripp Security. Lastly, our Fripp deer may be a bit disoriented by Irma. Stay clear of sharp hooves and antlers. Does will be especially protective of their young and could injure you. On a health note, you don’t know what contaminants are in the receding waters and debris left behind. Wear gloves and protective footwear. If liquids are splashed on your face or near your eyes…flush with bottled water. Be careful out there folks, watch out for your neighbors as well as those who come to help us and we will all get through this. Part of the sewer system is operational. The following areas have limited sewer service available at this time. If you live in these areas, you may begin flushing and other minimal usage of the sewer system. Please do not do laundry, take showers or run dishwashers! If you have any question about whether or not your property has sewer service available, please call our office at (843) 838-2400. We’d rather have you call to find out than have a sewer backup in your home! We hope to have more areas of the sewer system functional by the end of the day and will provide updates as soon as possible. We’re sorry for the inconvenience and thank you for your continued patience as we work to bring our systems back online. First – the overall condition of the Island: We sustained very little wind damage and only a few downed trees. The cleanup of downed trees and the substantial debris has commenced and should proceed very quickly. The Island did sustain substantial flooding, however. We began pumping the water today and by tomorrow we should have a total of 16 pumps on island and close to being in operation. Our plan is to continue to add as many pumps as we have available to us and eliminate as much water as quickly as possible. Pumping of standing water on the beach is not allowed and so the pumps will funnel water into the inlet, the marsh and the canal only. The water has begun to recede on its own but we still have five areas that, as of tonight, are deemed inaccessible. Those areas include are Remora, Marlin, Ocean Point Drive, Porpoise and Fiddler’s Ridge. Chief Senecal will continue to monitor all of the roadways and I will update you every day with the results of his report. If you are trying to access or have contractors access your neighborhood and there is significant standing water, please be sure to move slowly and avoid salt water splashing up under the vehicle. Also, remember to rinse off the undercarriage of your car after you have driven through salt water. Second – getting workers on the Island: We are trying to make it easy for contractors to have access to your property. Gate fees will be waived for the next 6 weeks. If a contractor is known and does work on the Island routinely, they should have no problem getting through the Security Gate. If you have hired a contractor from out of the local area, please call register them in advance with Security (843-838-2334), or better yet, get them a guest pass yourself to be sure they can get to you as soon as they arrive. Security will not be checking to insure all contractors are licensed, at this time in an effort to speed up the process of ensuring you have all the help possible. Please be sure to check with anyone doing work on your property. If you want names of firms who have done work on the Island and are known to us, please check the Fipoa local providers list or contact the FIPOA office (843-838-4155) and we will help you. Third- status of utilities: Electricity and water are in working order across the Island. FIPSD has informed us that the sewer system is not likely to be fully operational until Friday. Portable toilets have been located throughout the Island and it is highly recommended that everyone use them until FIPSD gives the all clear. I know everyone wants to get to his or her properties as soon as possible. If you can wait until the sewer system is fully operational, it would be best. The same holds true for guests. We are coordinating with FIPSD and the Resort to advise when guests should expect to be able to come onto the Island. As of tonight, it seems likely that could be over the weekend. Fourth- disposal of trash. Large Dumpsters will be delivered Thursday and they will be placed in The Springtide Village lot behind Sand & Seas. These are to be used for refrigerator/freezer garbage only. As for picking up white goods, we will get back to you with directions tomorrow. Fifth – status of the beach. The beach looks to be in pretty good shape, with little erosion. As soon as roadways are cleared, we will begin the process of cleaning the beach areas. Sixth- Thank you to all who have been providing photos and videos. Please continue to do so. A Dropbox has been provided, to make it easier to locate specific streets, areas, and homes. If we are missing some locations, let us know and we will do our best to get you a picture or status report. Many volunteers around the Island are more than willing to do so. When I get to the Island, I will be happy to do so myself. Dr. Rob Young will also be conducting a flyover shortly to compare the beachfront and we will post that video when we know more. Seventh – With regard to Security vehicles. I understand the concerns that have been expressed about the two security vehicles that were damaged by the rising tides when they might have been taken to higher ground. It was our decision to keep Security on the Island this time, to better protect our property and make access to returning owners and contractors easier. The decision to remain on the island appears to have worked well. In the process of using the vehicles to secure the Island, a major surge of water, approximating 3 feet in just a couple of minutes, damaged the vehicles as they sat at the office parking area. In retrospect, the vehicles should have been kept on higher ground – we agree. It is not a mistake we will repeat. We believe they are reparable, but nevertheless, it could have been avoided. Eight – Ongoing communications. I appreciate Dennis, Carl, and Tina attempting to keep up with the ND posts. They will continue to do so. Kate and her staff will continue to man the phones. They will be in the office tomorrow morning and will have four lines available. Please call them with any questions you have. Kate will transmit issues to me during the day. I will assume the responsibility of communicating with you directly each day as often as I need to. I plan to be on the Island on Thursday and will work out of the office. By then we expect to have half of the Board on the Island and we will be doing whatever we can to help in the process. I want to repeat what I sent to you this morning. We do not rest until the cleanup task is completed. We continue to work closely with the Resort and PSD and we will have a coordinated effort to do what needs to be done now and we will begin the process of making the needed changes and longer-term repairs. For the moment, this is our only priority. Damage to the causeway on US 21 near Harbour Island was repaired by the South Carolina Department of Transportation and re-opened to traffic at 2:00 PM today. Importantly, access to Harbour and Fripp Islands is in the hands of their respective property owners’ associations. We recommend residents of Harbour and Fripp Islands contact their property owners’ assocation before attempting to return to their homes. Currently access is for OWNERS only!!! Please provide your PIN code when you come to the gate. FIPSD will be sending out a statement soon, but we know that the Inlet Bridge has been given a clear inspection. The sewer system is still NOT safe to use. If you decide to return, do not flush! Porta Potties are being delivered. There is raw sewage near some of the lift stations. IF you return, you must be aware that you do so at your own risk. There is standing water on many of the roads and wildlife has been misplaced. Access across the Harbor River Bridge is restricted . There was damage to one lane at the end of the causeway, but it should be repaired by the end of the day. The Fripp Inlet Bridge is currently being inspected – we should have those results by the end of the day. If the engineers say the bridge is safe to traverse, we will left the travel ban TO OWNERS ONLY! The sewer system has not been restored, they are beginning to bring it back up now. There is raw sewage near some of the lift stations. IF you return, you must be aware that you do so at your own risk. Port-a Potties have been ordered and are on the way. The Harbor River Bridge has been compromised. It will remain closed until further notice. No one may return to Fripp unless they are a 1st responder. We will update you as we know more. I would also ask that we allow security to do their job and to protect our property and our neighbors first. As soon as we are allowed back on the Island I will join you and we will go to work on getting our Island back. The Board is having an emergency planning meeting later today to discuss how we go about the process of restoring our Island. The pumping has begun but we are in need more equipment. We will get it. Every resource at our disposal will be called in to assist with the restoration and we will solve every single one of our issues. We will try to help every single one of our property owners until all of the work is completed. We have asked everyone with access to send photos and videos so we have an idea of what we are facing. These are being placed on our webpage. We will continue to do place new pictures. This may be disheartening at times, but like you I want to see as much as I can as soon as I can. Thank you to everyone who has done the work necessary to get us through the storm. Now let’s get to work to rebuild again. The sun has risen and so will we. The Fripp Island Public Service District Commission is aware that severe flooding has occurred island-wide on Fripp, and that the PSD-owned portion of the Fripp Inlet revetment may have sustained additional damage due to wave action and storm surge from Tropical Storm Irma. While the District plans to continue with its large revetment repair project as quickly as possible, it is fully aware that severe damage must be remedied immediately. The Commission intends to move quickly on temporary repairs to shore up any damaged areas immediately following receding of the flood waters and lifting of the evacuation orders. The water system remains turned off at Beaufort Jasper Water & Sewer Authority’s master meter at the Shrimp Shack on St. Helena Island. At this time, we are unsure when the service will be restored, but are hopeful that it will happen within the next 24-36 hours. As long as the water remains off, the District’s fire protection capability is limited and there is no potable water for consumption. We’ve received reports of sewer smells in some areas of Fripp Island. The sewer pumping system is currently out of service and will remain so until power has been restored to all pumping stations. Due to strong storm surge and wave action, the Fripp Inlet Bridge must be inspected before it can be cleared for normal traffic. Arrangements have been made for this inspection and it will be completed as soon as possible. As soon as the roads are passable and safe, the District’s full field staff will be on-site to assess damages and begin recovery efforts. The District is committed to ensuring public health and safety on Fripp Island, and we are making every effort to ensure that the island is safe for your return. We appreciate your patience as we work to recover from this severe weather event. You cannot come to Fripp UNTIL WE HAVE RECEIVED WORD THAT THE INLET BRIDGE IS CLEAR! The Fripp Inlet Bridge is currently being inspected – we should have those results by the end of the day. If the engineers say the bridge is safe to traverse, we will left the travel ban TO OWNERS ONLY! Your FIPOA phone bank is open!!! And if you’ve had trouble getting through, we have volunteers to help. Please call(843)-838-4155 or (847)-910-0287, or (770)-877-0512 until6:00PM today if you have questions. Special Shout-Out to Andy Meloan for sending us the videos to use in this video montage!